Make sure you check out all the other designers in the stores too as everyone has some great specials on! If you are after some scrapbooking supplies this is definitely the weekend to go shopping!!! And now for the freebie. I have a Commercial Use OK flower template for you. 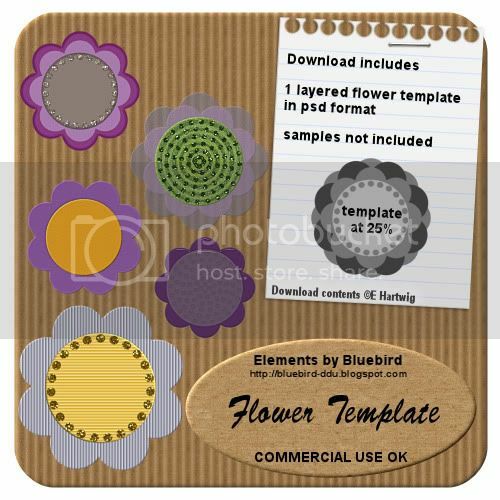 Close off layers of the template to create your own custom flowers. Use your Colour Replace Tool (Paint Shop Pro) to colour the template with your favourite colour, gradient or pattern then apply your favourite filters or textures to get different effects. The largest flower is approximately 500 pixels wide but you can resize your template to whatever you want. Your only limit is your imagination. NEW CU Freebies Only Forum on Tuesday November 17th 2009, in this topic: Templates Your Place to find Commercial Use Scrap Booking Freebies!